Using ethorobotics, researchers from the BioRobotics Institute and the Zoology Institute of Bonn University published a novel ‘dummy fish’ to study the social behavior of weakly-electric fish Mormyrus rume (Boulenger) (Osteoglossiformes: Mormyridae). Ethorobotics is an emerging field combining the interests of roboticists and biologists. It aims at investigating and influencing the behavior and social interactions of animal species through robotic agents. These agents are designed around different cues that facilitate their acceptance and lure animals. Once the robots have been accepted in the animal group, they are leveraged to feed information into the animal societies and influence their behavior. In this way, it is possible to observe how animal groups react to different stimuli and unveil the principles behind their social interactions. The ability to create robots that can influence animal behavior moves us not only closer to a deeper understanding of social interactions in living beings but also stands to make a remarkable socio-economic impact on our daily lives with applications like control of animal populations in agriculture, improvement of animal farming conditions, waste management, air traffic control and protection of endangered species. While most state-of-the-art research focusses on visual or chemical cues, researchers in this study explored electric signals as communication means to interact with weakly electric fish, the Mormyrus rume. For example, Mormyrids were shown to rely on their electro-sensory capabilities for territorial behavior, mate choice, or group formation and coherence in shoaling. The researchers used mormyrids as a model organism because electric signals can easily be brought under the experimenter’s control by means of electrical playback signals, allowing for a fine tuning of the cues sent to the fish. Through rapid prototyping, the researchers developed a dummy fish with a morphology analogous to its natural counterpart. The robot was equipped with two emitting electrodes — integrated at the tip of the snout and the very end of the tail — as well as several receiving electrodes distributed along the body. This spatial layout allows for generating signals with a highly specific, electric fingerprint recognized by Mormyrids. The robot was also equipped with a soft, silicone tail that can oscillate at different frequencies and amplitudes. Several experiments observed the reaction of a single Mormyrid while the dummy fish performed selective activation of caudal fin oscillation and electric signalling. The tested combinations of cues evoked different attraction responses. Ultimately, the experiments showed that the electric signal played a crucial role as a key stimulus in inducing “following behavior,” while there was no significant effect of motion pattern on attractiveness of the dummy. However, realistic motion helped when convincing a group of Mormyrids; similar experiments showed the fish were more attracted by the dummy fish generating an electric signal combined with tail movement. 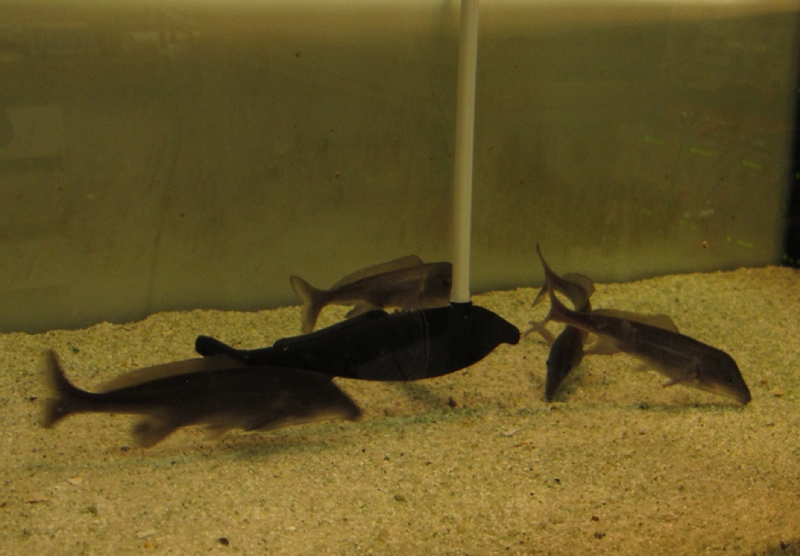 Eliciting a following behavior in the fish is the first step toward investigating more complex social behaviors through closed-loop feedback experiments based on electrocommunication.